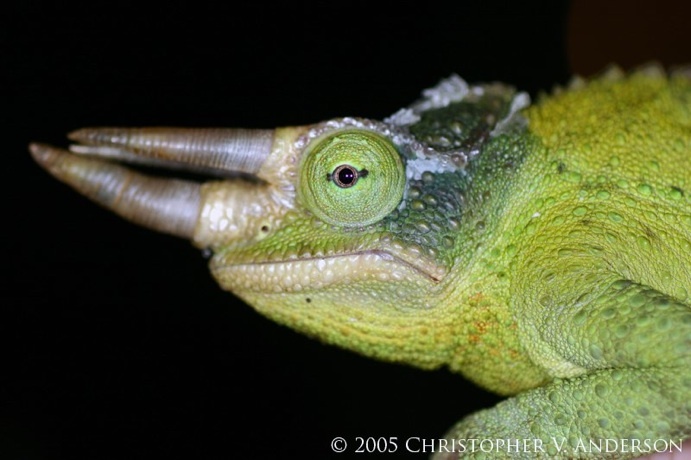 The Jackson’s chameleon, Trioceros jacksonii ssp., is perhaps the most well-known member of the Chamaeleonidae. 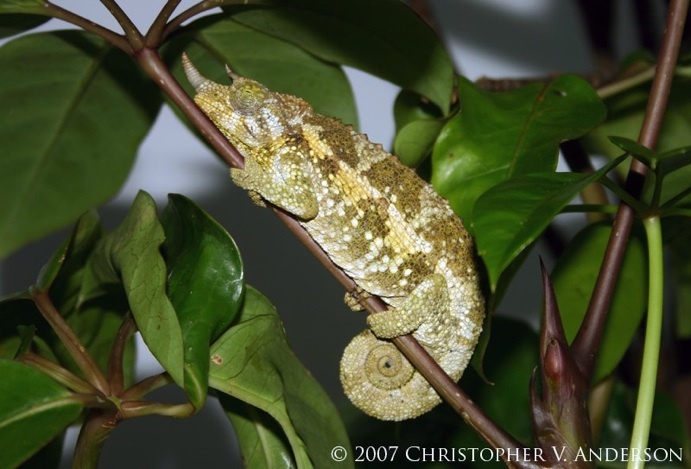 Although there are other species of chameleons with three annulated horns, this small- to medium-sized chameleon has remained the most frequently encountered of them in the pet trade for at least the last twenty years. As well, many a fledgling chameleon-keeper first became interested in this fascinating family of lizards upon first being introduced to the Jackson’s chameleon. 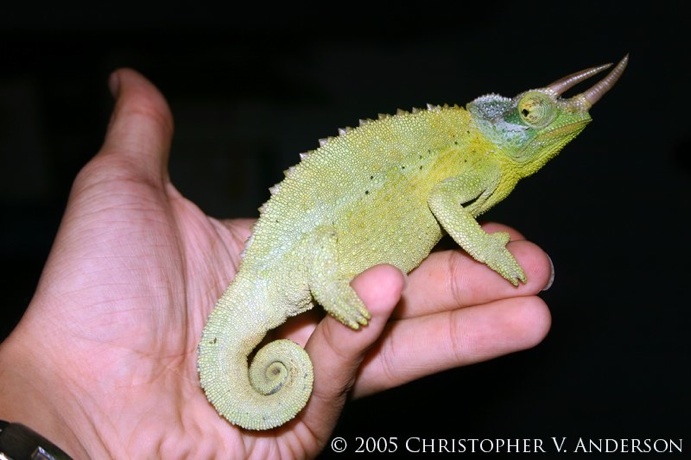 Its manageable size, usually calm demeanor, adaptability to captive diets, relative hardiness, dinosaur-looks, and stunning beauty have all contributed to make it one of the most-kept species of chameleon, perhaps third only to the very common veiled (Chamaeleo calyptratus) and panther chameleons (Furcifer pardalis). Male Trioceros jacksonii xantholophus. Photo by Christopher Anderson. 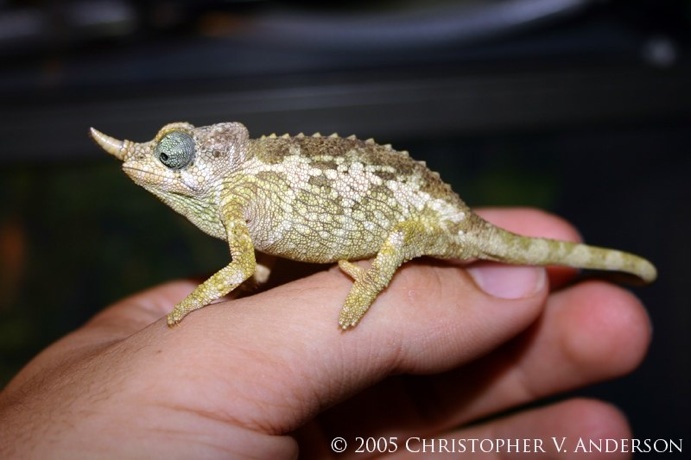 While many beginning chamaeleophiles are encouraged to begin with a captive-hatched specimen of the two most popular species, keepers with little to no experience with chameleons can be just as successful with Jackson’s. When I first became interested in keeping chameleons, captive-hatched specimens of any species were few and far between. Regardless, the horns of the chameleons from East Africa looked the most exotic and, as the reproduction of a live-bearing chameleon species seemed easier than incubating eggs, Jackson’s were chosen as the introductory species. Despite warnings from my employer at the pet shop that chameleons were a “waste of money” and “sure to be dead in three months,” the little pair of T. j. xantholophus adapted well to my beginner’s mistakes and thrived. With that first pair came some very important lessons. The first is the importance of beginning with healthy animals. Although I would learn that lesson later, I now attribute much of my initial success to receiving the pair as young adults in prime health. The second was learning to “do my homework.” After purchasing the two chameleon books and flipping through other reptile books at work, networking and speaking with people from the local herpetological society, and preparing myself mentally, I set up their cages. Finally, the importance of monitoring animals daily for normal activity and health cannot be understated. 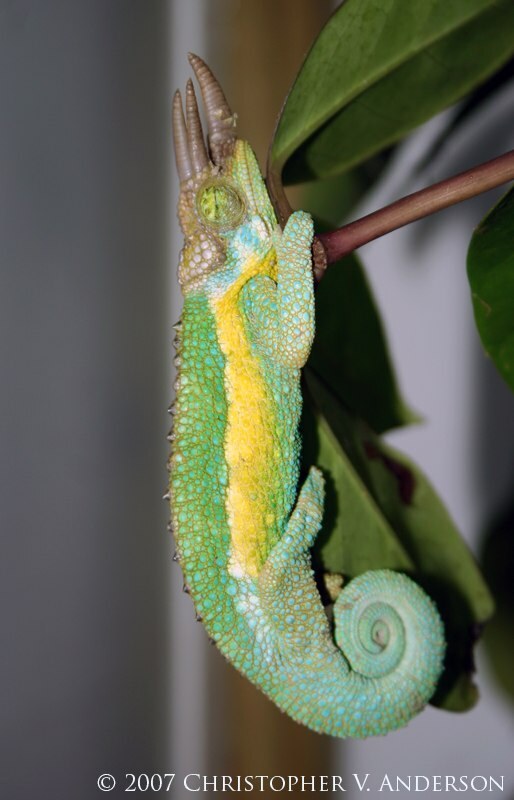 Although the cues may be slight, changes in behavior may indicate a problem that needs addressing and a proactive attitude with chameleons is always ideal. The Jackson’s chameleon was originally described by the Belgian-British naturalist George Boulenger in 1896. Boulenger named the species in honor of the collector of the museum specimen used for his description. Three subspecies of Jackson’s chameleon are currently recognized although conversations on internet message boards have suggested the possibility that new subspecies may be described in the near future from work being conducted on populations showing different variations. The natural range of the Jackson’s chameleon is in the East African nations of the Republic of Kenya and the United Republic of Tanzania, although the largest of the three subspecies was introduced to the Hawaiian Islands where it is now firmly established. 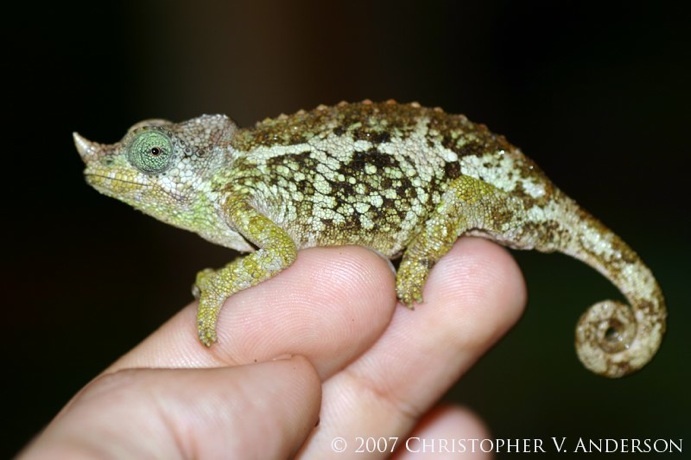 The smallest of the currently recognized subspecies, the Mount Meru or Dwarf Jackson’s chameleon (T. j. merumontanus), is found only in Tanzania while the two larger are natives of Kenya. Sleeping male Trioceros jacksonii jacksonii. Photo by Christopher Anderson. The most commonly seen species of Jackson’s chameleon in captivity in the U.S. is the Mt. Kenya Jackson’s, T. j. xantholophus. 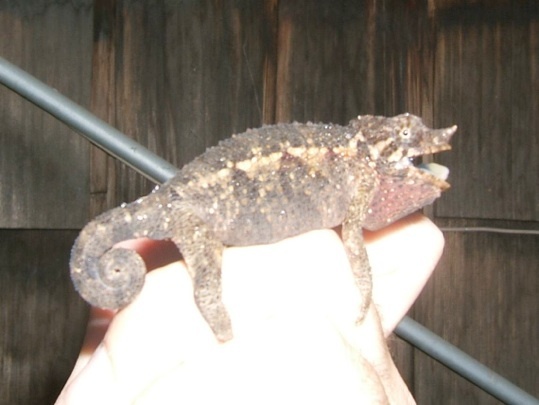 This largest of subspecies was introduced into the wild of Hawai’i by a pet store owner trying to rehydrate a shipment of chameleons that did not travel well several decades ago. That small founding population reproduced successfully over many generations and has since spread to several of the larger islands in Hawai’i with man’s help. These Hawaiian populations are now the source for most of the Jackson’s chameleons sold in North America. 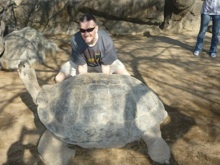 Males of T. j. xantholophus attain the largest size of the three subspecies, up to 14 inches in total length. They have three well-developed, annulated horns while the females of this subspecies usually lack horns although occasional individuals may have just a tiny stub on the rostrum. Female Trioceros jacksonii xantholophus. Photo by Christopher Anderson. The nominate subspecies, T. j. jacksonii, has the widest natural range but is, perhaps ironically, the most rare and under-represented subspecies in herpetoculture. Males have three very robust, annulated horns and females, even from within the same population, may have either one rostral or all three horns (although they are not as strongly developed as in males). Coloration in males may vary by individual with some being uniformly dark green and others, often referred to as the unrecognized T. j. “willegensis,” have striking aqua blue heads and a bright yellow, rectangular-shaped marking that covers much of their flanks. Females are generally a lighter shade of green than the other two subspecies however exceptionally light or even red T. j. xantholophus females are not uncommon. The spacing and number of dorsal crest spines is intermediate between those of the larger and smaller subspecies, also. Body size of the nominate form is also intermediate with males attaining 8 to 10 inches total length. Male Trioceros jacksonii jacksonii. Photo by Kent Manchen. Female Trioceros jacksonii jacksonii. Photo by Kent Manchen. Sleeping female Trioceors jacksonii jacksonii. Photo by Christopher Anderson. As stated earlier, the Mt. Meru Dwarf Jackson’s Chameleon is the smallest member of the species with males topping out at a maximum of 7 or 8 inches. In addition to their smaller size, males of T. j. merumontanus may be differentiated from their larger cousins by the extensive yellow on their heads, particularly around the base of the horns and face. The body color is often either a darker green than the other subspecies or a very attractive blue-green that is also unique. Although the face may be yellow or olive green, the eyelids are often that blue-green color, as well. The cone-shaped spines of the dorsal crest are the most widely-spaced of the three subspecies although recognizing the differences in this feature may be difficult to see at first. The horns of this subspecies seem to be the least robust and imported males arriving with broken horns are not uncommon. Females of T. j. merumontanus may be identified by their diminutive size and the presence of a single, poorly-developed, rostral horn. Male Trioceros jacksonii merumontanus. Photo by Christopher Anderson. Female Trioceros jacksonii merumontanus. Photo by Christopher Anderson. Although Jackson’s chameleons are typically considered a montane species that should be kept similarly to other chameleons from high-altitude rainforests, it has been my experience that the two Kenyan subspecies do best when kept in a sort of hybrid manner. While they most certainly need and benefit from higher water intake and humidity than lowland species, they are highly heliophilic. Having said that, it is important to remember that their threshold for high temperatures is lower than that for the more commonly kept lowland species. However, seeing very dark-colored adults lateral basking in full sun on days in the low- to mid-80 degrees Fahrenheit is very common. The Tanzanian subspecies, T. j. merumontanus, seems to prefer cooler temperatures. For this, a lower wattage bulb should be used for heat as well as more distant placement of the basking spot(s). Female Trioceros jacksonii merumontanus. Photo by Chris Anderson. Indoor cage lighting should consist of a UVA/UVB bulb and a standard incandescent bulb for heat. The UVA/UVB bulb reproduces light spectrums that are both physiologically and psychologically beneficial to Jackson’s chameleons. While the UVB is necessary for synthesis of Vitamin D3, a necessary chemical for the proper processing of dietary calcium, the UVA may also promote more normal behaviors in indoor animals, including breeding. Cage furnishings should provide enough coverage for the chameleon to adequately hide itself from outside view. Like most chameleon cages, a combination of sturdy, cut branches and hardy, indoor plants that can take lower levels of light and lots of water works best. 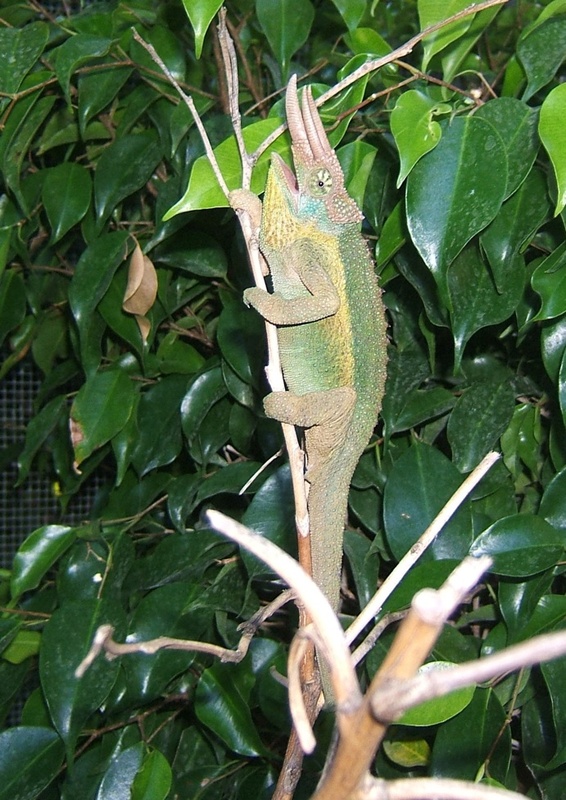 Schefflera arboricola has proven particularly well-suited for Jackson’s chameleon cages over time. Position live leaves and stems away from the basking light to avoid accidentally burning them. This will also allow the keeper to witness the Jackson’s interesting lateral basking behavior in which they turn their darkest colors and position one vertically-flattened side toward the heat source. Female Trioceros jacksonii jacksonii hiding in the foliage of her enclosure. Photo by Kent Manchen. 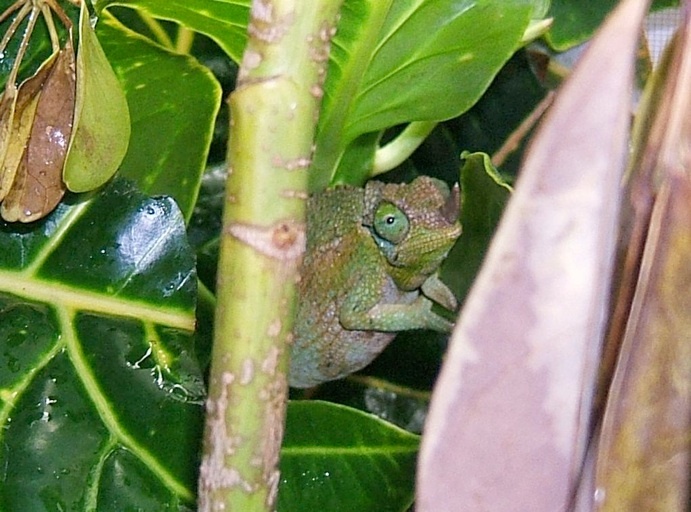 All Jackson’s chameleon subspecies come from areas with high humidity and rainfall. As a result, these two characteristics of the simulated natural environment for this species cannot be overlooked without detriment to the animals’ health. Several daily mistings of the cage will be required to keep humidity high (being sure to provide enough airflow for the cage to dry out between misting,) as will a water delivery method that ensures the animals consistently drink their fill. This can be accomplished by a number of methods. The easiest method is to install an automated misting system that is programmed to run for several cycles per day. I prefer to mist in the mornings and evenings as the temperatures begin to cool down. While more misting sessions per day may be added, allowing each the time for water to collect and “rain” on the animals enough to stimulate them to drink their fill twice a day is sufficient. Of course, acclimating imported Jackson’s chameleons should involve particular attention to hydration and I like to water them excessively during the first month in their new homes. Another method of water delivery for those so-inclined is hand-misting. The first pair of Jackson’s chameleons in the my care learned very quickly that water came from the spray bottle used to wet the plants in their cages. After a short time they would both take water directly from the bottle. The first step is to stimulate them to drink with a normal cage misting. Once they are drinking from leaves or even from lightly spraying their face and lips, they will stick the tongue out of the mouth far enough to just spray or drop a little bit of water onto it. Take care not to give too much water at a time. If they don’t become alarmed by something, this can usually be continued until they have their fill, allowing the keeper to have a very good sense of how much water they really are drinking. Male Trioceros jacksonii xantholophus feeding on silkworms. Photo by Christopher Anderson. In general, Jackson’s chameleons are not very picky about diet and accept a wide range of invertebrate prey. 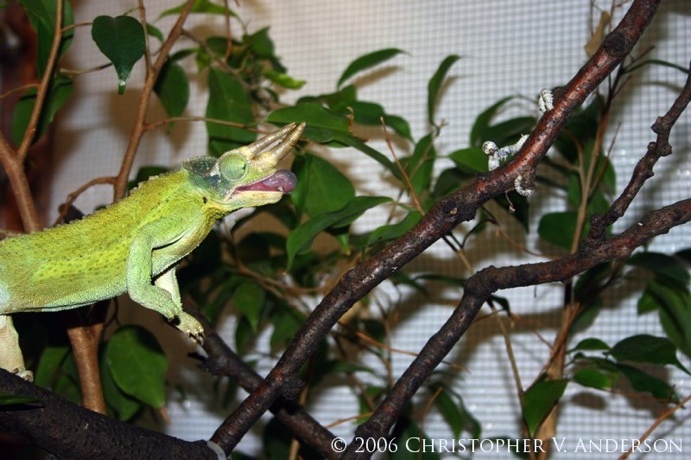 Although crickets can be used as an easily gut-loaded staple, these chameleons relish worms such as superworms, wax worms, silkworms, and hornworms. 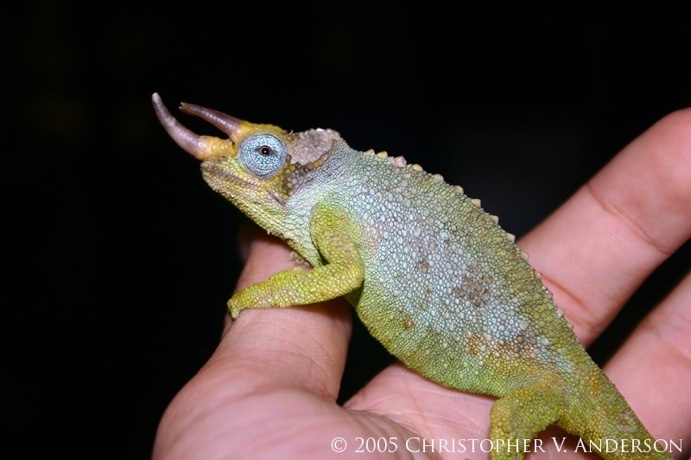 Jackson’s chameleon is also one of the chameleon species that absolutely loves eating small garden snails and slugs. Snails should be small enough to still have very thin, relatively fragile shells to avoid injury. All wild prey must be collected from pesticide-free areas. When sexually mature, most healthy male Jackson’s chameleons will launch into a fascinating ritual of side to side head-bobs and jerking movements upon sight of a female. If the female is unreceptive to his advances she will turn a very dark, mottled pattern, curl her tail up, face a laterally-flattened side toward him, and violently rock from side to side on her branch with open mouth. If the male continues to advance, he will likely be grabbed by one of his horns, only to have his head shaken while she is rocking side to side. Receptive females will remain their normal, at-rest colors and allow him to approach and mount. Copulation lasts roughly 10 to 20 minutes. Like other chameleon species, the pair may be kept together until the female starts showing unreceptive behaviors, such as described above. Pair of Trioceros jacksonii jacksonii breeding. Photo by Kent Manchen. 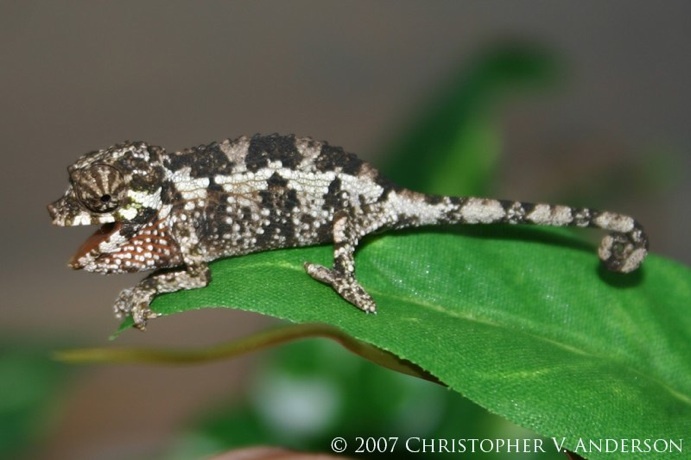 While most chameleons lay eggs, all members of the genus Bradypodion and a few members of the East African Trioceros are ovoviviparous, or give live birth. 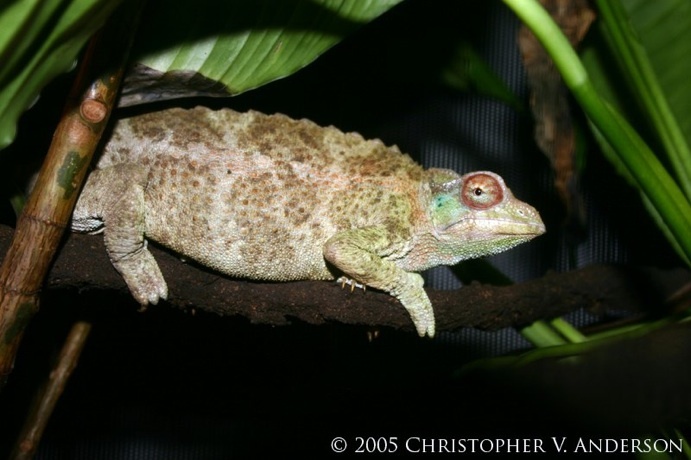 Gestation in ovoviviparous chameleons may vary with environmental temperatures and birth of Jackson’s chameleons may occur from 7 to 10 months after copulation, although much shorter periods have been recorded. Gravid females should be housed individually in cages with small enough screen to prevent neonates from escaping. Also, the developing embryos add physical stress to females and the nutrition and calcium content of captive diets should be especially important to keepers during gestation. When it comes time to give birth the females will do so within their plants. The young are born enclosed in thin membranes which stick to stems and leaves rather than allowing the babies to fall to the ground. Once they are up and walking around they are virtually miniature adults and may be moved into their own neonate housing. Many species of live-bearing Trioceros are known to have difficult to raise babies and Jackson’s are no exception. Unfortunately, many people have initial success with babies living for several months only to have the heartbreak of watching them perish, seemingly for no reason. When speaking with other keepers about raising baby Jackson’s, the best results usually seem to be from keeping the neonates in all-screen enclosures, kept outdoors. As this is not possible in all climates, similar caging that emphasizes a high amount of air flow and bright light while also providing the necessary humidity and hydration is the ideal. Neonate Trioceros jacksonii jacksonii. Photo by Christopher Anderson. The small size of neonate chameleons limits the keeper’s food choices but one week old crickets and fruit flies are readily available and relished by the babies. When deciding how much to feed, the young should have constant access to feeder insects throughout the day without having more than just a couple left over after lights-out each night. As the young continue to grow, I find it best to separate the males into individual enclosures as they begin to mature from their drab baby colors to their more vibrant adult colors. This will help to prevent most of the intraspecies aggression as well as unplanned reproductions between siblings. Juvenile female Trioceros jacksonii jacksonii. Photo by Kent Manchen. Jackson’s chameleons can be one of the most entertaining and interesting chameleon species to keep. 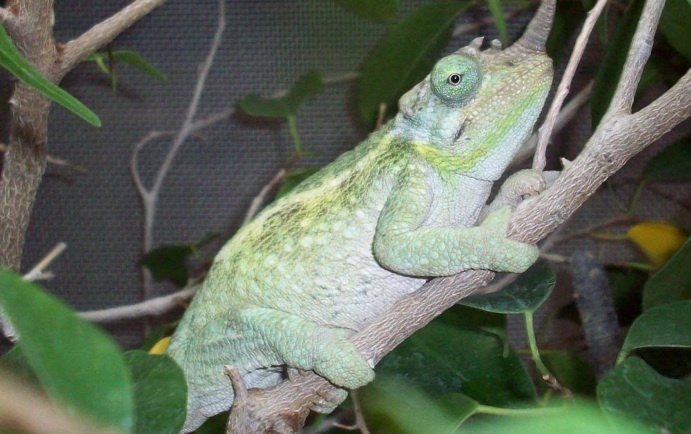 Their obvious physical attributes and adaptability to a captive lifestyle make them worthy candidates for new and seasoned chameleon keepers alike. While it is easy to see the attraction that many have towards this little gem of the chameleon world, be warned: for many people Jackson’s chameleons end up being a gateway into a much larger chameleon addiction! Necas, P. (2004). Chameleons: Nature’s Hidden Jewels. 2nd Edition. Chimaira Buchhandelsgesellschaft, Germany. Kent Manchen worked at a reptile-heavy pet store at age sixteen where he was introduced to many species, including chameleons. 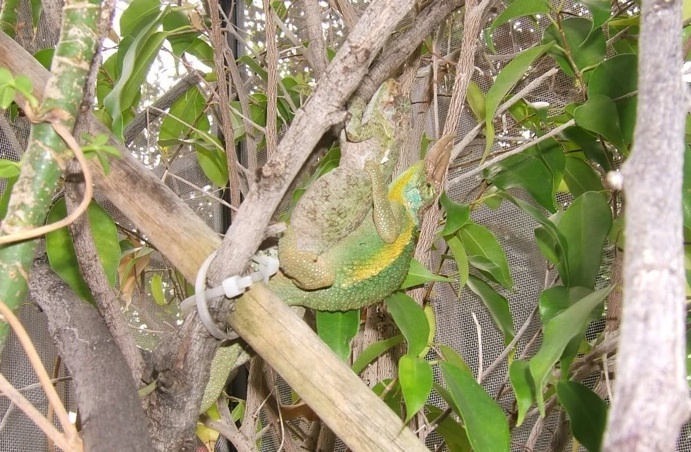 As a result, he has been keeping chameleons since 1991 and to date has worked with 28 species of Chamaeleoninae and 2 of Brookesiinae. He is currently focusing on keeping a few, favorite species, including Trioceros jacksonii jacksonii, T.deremensis, T. pfefferi, and Furcifer pardalis. In addition to keeping chameleons, he recently successfully reproduced green tree pythons (Morelia viridis) for the first time. He is currently working as an archaeologist while completing his Master's degree at San Diego State University. Currently, Kent is an Assistant Editor of the Chameleons! Online E-Zine and can be emailed at kentmanchen@hotmail.com.